Ps. Cavendish Beach is really quite famous. It is 5 miles from Anne of Green Gables' house. Beautiful beach. Love that red sand. Thanks R.V. I just couldn't imagine getting all that red sand off. I'm glad there is some white sand. I will go one day. It's just been postponed for a while. Anne 'with an 'e'. There are both red and white sand beaches there. Beautiful endless beaches and amazing vistas of them from various lookouts. Hope you make it there someday. Have all the beaches on PEI got red sand? I read somewhere that some have white sand. Thanks, Anne Dornay. 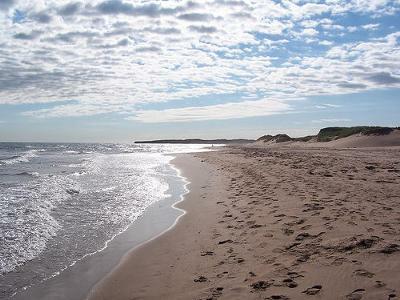 My daughter and I camped there on the beach in PEI years ago but it will always be one or our most memorable vacations. She made an Indian Mermaid of the Sea sand sculpture out of sand, blue mussel and clam shells, Irish moss of various colors, red and green sandstones, and lovely long leaves for the flipper of the tail. It took us nearly the whole two weeks to collect the materials. She was then a great fan of the movie, Under the Sea, and the character Ariel, of course. What a wonderful beach!And the wild fox are amazing!